The HPC Western Pine Style Outdoor Ceramic Gas Log Set provides a high quality set of outdoor logs to enhance your gas fire pit. The ceramic fiber material produces a durable and realistic feeling set of logs while the painted pine wood style logs feature a neutral gray/brown tone for an authentic fire look. This set includes 5 pieces of 15 - 19 inch logs and is intended for use with a 30 inch fire pit burner. Seek a professional help with installation..
Uniflame LP Gas Outdoor firebowl with slate tile and faux wood mantel and includes bronze colored glass. 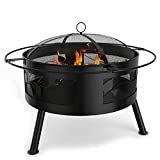 This Napa XL portable outdoor firebowl fire pit is perfect for camping and campfires, backyards, patios, RV fireplace setting, and tailgating. This gas fire pit bowl burns clean from the fire ring. It does not require gas lines, gel cans, chimenea, chimney, ethanol or electric. However, it does require LP propane or natural gas. This outdoor propane fire bowl fire pit is light weight, easy to carry and also burns clean and smokeless. This LP propane portable fire pit includes lava rocks, and a 10 foot hose with an attached regulator. However, you may purchase ceramic gas logs for an additional feel of a wood burning fire pit. It is time to break away from the mundane appearance and inefficient wood and ceramic logs traditionally used in indoor or outdoor fire pits and fireplaces. As more people seek out new ways to innovate their décor, fireplace glass crystals, also referred to as fireplace glass, or fire pit glass rocks, are becoming infamous for providing a beautiful addition to any home while being a more efficient source of heat and energy. Fireplace glass and fire pit glass can be used indoors and outdoors and is available in many different colors which are sure to match any decor or unique taste. Further, all of our fire glass is quality inspected by highly trained professionals to ensure impeccable performance, elegant appearance and 100% customer satisfaction. Shipping Details: We ship all our items via USPS priority 2-3 day so you will receive your items shortly. Tracking information isn't always accurately depicted online as delivery dates or anticipated delivery dates may vary. Orders with multiple items may ship separately and may be delivered on separate days. LP gas outdoor firebowl with tile mantel. Note: Improper installation, adjustment, alteration, service or maintenance can cause injury or property damage. * Do not leave this appliance unattended while it is in operation. * Do not operate the firepit in winds that exceed 10 MPH. * Do not replace the lava rocks with other burner media such as crushed glass. 30,000 BTU's of powerful heat to cover up to 150 sq. ft.
Handcrafted tile mantel with porcelain steel bowl and accessible control panel with electronic ignition. Variable flame setting to set the heat or set the mood. Improper installation, adjustment, alteration, service or maintenance can cause injury or property damage. Do not leave this appliance unattended while it is in operation. Do not replace the lava rocks with other burner media such as crushed glass. The HPC Black Lava Rock provides a high quality fire media for use with your gas fire pit or fireplace. Lava rock is proven to increase combustion efficiency and it enhances the look of your fire feature. The organic material is naturally resistant to high heat while the natural black color rock creates a realistic volcanic visual. The rocks range from 1 to 2 inches in size and comes in a 1/2 cubic foot bag or roughly 23 pounds. Bring the warmth and loved experience of a campfire, anywhere you go. The standard Outland Firebowl is CSA approved and safe to use during most bans, and can be used while camping or in the backyard. The Outland Firebowl built for long lasting durability; they are constructed from high quality steel with a protective enamel finish! All you’ll need is a 20lb propane tank and a barbeque lighter, and you’ll be enjoying the smoke-free Outland Firebowl for hours. Also: NEW CSA approved Natural Gas Conversion Kit Now Available Separately! 58,000 BTU propane fire bowl provides a clean and smokeless flame which rivals a natural campfire. This CSA approved fire bowl is safe to use during most campfire bans. Includes pre-attached 10 ft. hose with regulator, propane tank stabilizer ring, and decorative rock set. NEW CSA approved Natural Gas Conversion Kit Now Available Separately! Lightweight and portable, the Outland Firebowl allows for an easy set up with no tools required. Steel construction with high temperature powder coating and protective enamel finish offers long lasting durability. This product is a 18" Black Steel Double Fire Pit Gas Burner from Stanbroil factory. 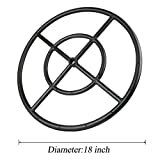 Fire pit rings are hand crafted from 100% 304 Black Steel and have been optimized for fuel distribution and natural flame production and 304 Black Steel material will remain trouble free in the outdoors. Fire rings are designed to be used only in an outdoor fire pit using natural gas or propane fuels and also be used for gas logs, lava rock, fire glass etc. Flame height is directly related to the BTU output of the unit. For maximum flame height, allow for BTU 147,000. Stylish Design:New cross-bar design for better gas distribution,Suitable for either Natural Gas or Propane.If using for propane an air mixer valve must be installed. 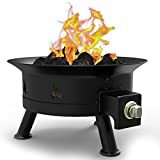 This mesh portable outdoor firebowl fire pit is perfect for camping and campfires, backyards, patios, RV fireplace setting, and tailgating. Wood poker and spark screen included. All you need is wood for your fire pit. It does not require gas lines, gel cans, chimenea, chimney, ethanol, LP propane, natural gas or electric. 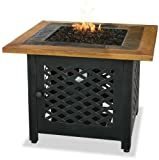 This outdoor fire bowl fire pit is light weight and easy to carry. 360-degree view of the fire. 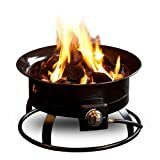 This round metal firepit can be used as an outdoor heater, RV appliance and fireplace. RetiredRVer.com is a participant in the Amazon Services LLC Associates Program, an affiliate advertising program designed to provide a means for sites to earn advertising fees by advertising and linking to Amazon.com.